A 1910 Waterman with an unusual filling mechanism! This Waterman is a (5)12 SF “Sleeve-filler” in 14K Solid Gold “Filigree” pattern on black hard rubber. 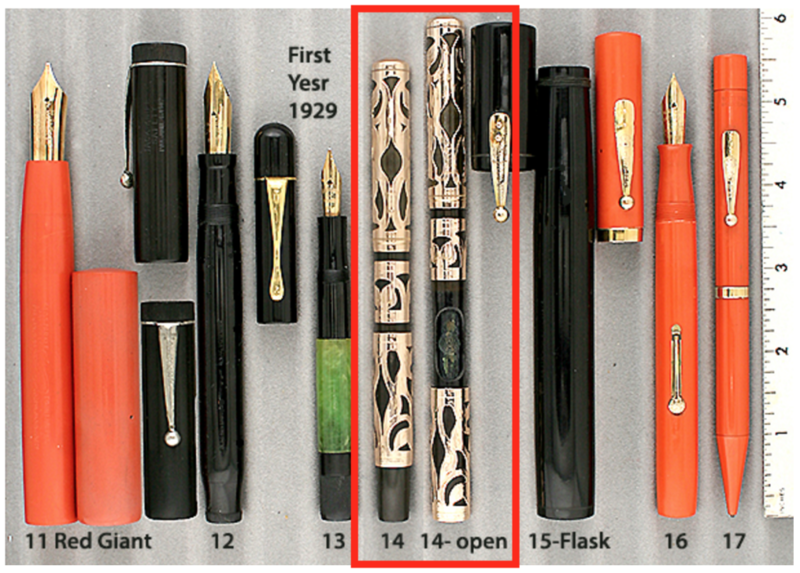 In-between the “Pump-filler” and “Coin-filler” Waterman produced the Sleeve-filler in 1910. A sleeve on the barrel slides downward to reveal a press bar used to fill the pen. A rare and wonderful example of this early Waterman filling mechanism. Barrel indicia engraved in Old-English script “TBM.” Broad, flexible, italic nib. A hint of barrel ambering and inspection under a loop reveals minor scratches here and there, otherwise near mint+. This entry was posted in Vintage Pens and tagged Fountain Pens, Sleeve Filler, Waterman. Bookmark the permalink. Follow any comments here with the RSS feed for this post. Post a comment or leave a trackback: Trackback URL.